After a summer abroad, I am now back home in Los Angeles. 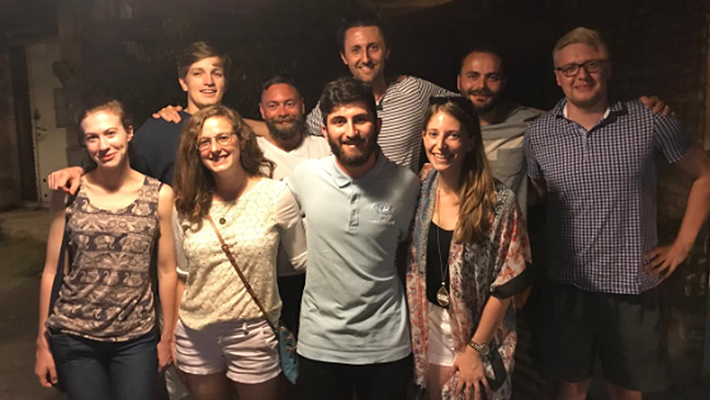 I was happy to be home and see my family and friends, yet I almost instantly began to miss the people I met at the Rondeli Foundation, as well as the food I ate in Tbilisi, Georgia. After two months of traveling, Tbilisi was the first place I could call home for the summer. I was in the beautiful city for about seven weeks. My work at the Rondeli Foundation was both interesting and productive. The Foundation as a whole conducts research on defense and security issues in Georgia specifically, but also in relation to Russia and the surrounding countries of Turkey, Armenia, and Azerbaijan. I was fortunate to help out many of the researchers, finding articles and giving briefings, but I was also fortunate to participate in a lecture series on the basics of Georgian foreign policy and conduct my own research on changes in Georgian-US relations from the Obama Administration to the Trump Administration. The lecture series provided an overview of Georgian foreign policy. The Rondeli research fellows described in detail recent Georgian history as well as the cultural and historical significance of the people. Georgia’s history is complex, yet its people have always persevered and thrived. In 2003, the population rebelled and took control of their destiny. Since then, the Georgian government has strived to become a close friend of the United States and the EU while attempting to preserve and maintain its culture. In my personal research on changes in the US – Georgian defense relationship from the Obama Administration to the Trump Administration, I was grateful to have the opportunity to meet with multiple research fellows at the Rondeli Foundation who had extensive experience working in the Georgian government. Another fellow was specifically a defense and security expert who provided me with an honest assessment of how the Georgian military would react to further Russian aggression. I was also fortunate to interview a representative from the Foreign Ministry of Georgia. Overall, I concluded the US and Georgian governments have become closer under Trump than under Obama, yet it still remains to be seen how much the Trump Administration will support the Georgian government in its ongoing, contentious relationship with Russia. Outside of my internship, I enjoyed experiencing Georgia. Tbilisi is a mix of Georgian, Turkish, Russian, and Middle Eastern cultures which, when blended together, creates a unique and beautiful city. From Soviet bathhouses in the Turkish style to homemade khinkali (Georgian dumplings), to the famous khachapuri (cheese bread), Georgia has everything and the “Georgian charm” that so many expats speak about is certainly real. While Tbilisi is certainly beautiful, my favorite adventures in Georgia took place outside the city. In July, I went to the World Cup in Rostov-on-Don, an experience I will never forget, and in August I went to Gori, the birthplace of Stalin and Kakheti, the wine region of Georgia in the east. Yet neither of these experiences might be as unique as my journey to Yerevan, Armenia. The local mode of transport around the Caucuses and Central Asia is marshrutka, or mini-bus. So, from the Avlabari metro station in Tbilisi, I embarked on a six-hour marshrutka ride from Tbilisi to Yerevan. The trip into Armenia was smooth, but once we passed the border crossing, the road was bumpy, unpleasant, and windy. Certainly not for someone with motion sickness. The road in Armenia went up and down, straddling the border with Azerbaijan. The drive was long and tiring, but well worth it as Yerevan is beautiful. My time in Tbilisi was short, but well worth it. The people I met at the foundation and the locals in Georgia were welcoming. Of all my travels over the summer through Europe, Tbilisi was my favorite city not only for its unique culture, but for the people as well. From local soccer or rugby matches, to the food, to the hot but familiar weather, I thoroughly enjoyed my time in Georgia and was very thankful to have been given the opportunity to explore the country for as long as I did.